The last set of tyres I got are now over 7 years old, but the choice of tyres in the same size is now limited. 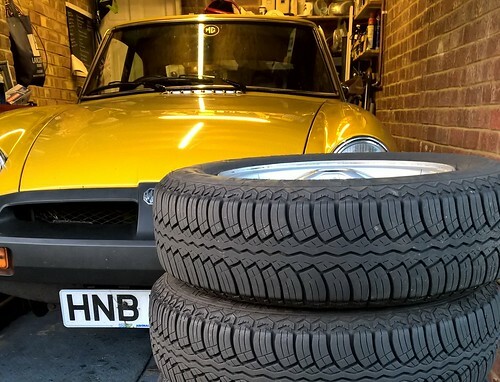 While there was loads of good tread left on the UniRoyals, tyres only have a limited life before the rubber starts hardening and 7 years is a good run for a set so before a planned long-distance run seemed a good time to switch. Last time I went for UniRoyal 165/80/14s which were the OEM size, but now they are harder to get hold of and there isn't much else in that category. After talking to a few other B owners I also wanted to try out a slightly wider tyre so looked at 175/70/14s. There are a few more options in this size and I settled on some Vredestein T-Trac 2, a tyre which has a good reputation in the wet and the dry. As always the struggle is finding somewhere to balance the Rostyles on the lugs, but Great North Tyres near the Tyne Bridge supplied the tyres and also sourced a lug balancer to do the job properly.